Yet always end on the surface, where we start. Forsake the privileged instant for the gradual and continuous. But the least push deserves an answering pull. Thanks to the Vermont Studio Center, I‘ve been able to spend a month exploring and responding to the beautiful terrain of the Green Mountains, working each day by the flowing waters and cascading rapids of the Gihon river. The month began in heavy snow and ended with the first signs of spring, as the ice flows slowly dissolved and the rivers rose up with the roar and rush of melt water. Arriving from London with two rolls of paper and a few drawing materials I set out to find a way of recording this parcel of time by interacting with the river’s alchemy, pacing out the days - sometimes icily cold, sometimes warm and wet as the season changed - with images made both with the water and of the water. Responding to its vibrant sounds, both its pulsing rush and gentle whisper, was a way to reconcile its irresistible force and glittering surface with the mutating course of its submerged history. 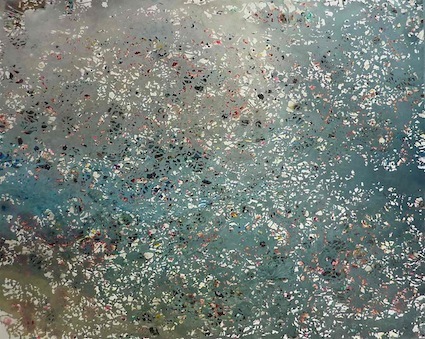 The resulting series of images, each made in one continuous sitting, developed their own non-verbal language: a kind of writing on water, in water. Johnson Vermont USA: International Artists residency, March 30th - April 26th 2013. A cloud floats by: a suspended moment, a weightless presence, an unformed thought, a singular impression on the face of the earth. A small lithograph to begin the new year, printed by the Curwen Press, January 2013.
cross country explores the subtle graphic and spatial interplay between the work of three artists who each recover, through the cryptic tracery of lines and marks, crossings and erasures, the tactile experience and remembered contours of their chosen territory. The large wall piece, a ‘spatial re-enactment’ in white chalk created for this project by Andrew Vass, concentrates on ‘the performative nature of drawing, the trace in relation to spaces, as a direct response or an internalized choreography’. Alongside, Kate Palmer shows three of her recent portrait format drawings which relate to her snowboarding experiences, while Luke Elwes extends through his new work on paper an enquiry into the mind as landscape and how mark making becomes a means of crossing it. 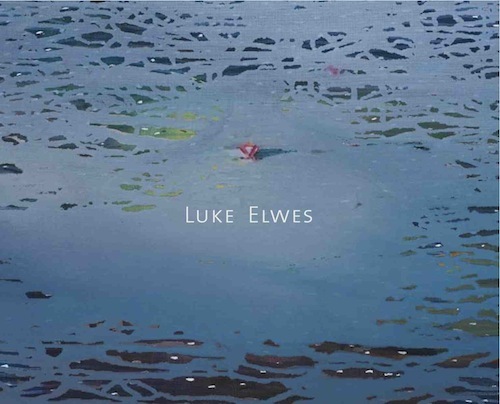 The territories mapped out by Luke Elwes in these works have all the appearance of a recorded space grounded in memory, while remaining elusive and fluid. Serpentine forms and dynamic gestures emerge and dissolve in the falling light and rising water, where space - a fusion of sea and desert - seems simultaneously to be stretched and erased. 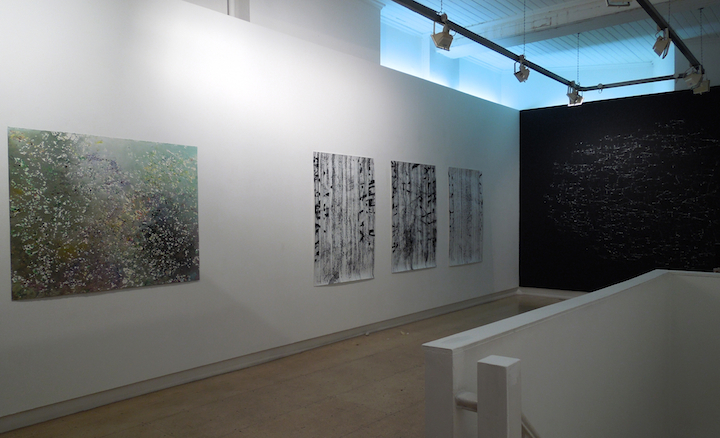 Oscillating between presence and absence, the paintings induce a state of contemplative reverie. ‘What I find so unusual and compelling about the work', the author and traveller Robert Macfarlane has written, 'is the hover between encryption and archetype, enigma and fabulous openness'. And so Robert Macfarlane’s journey proceeds, on foot, in words, through time, territory and collective memory. He and I have quite often followed the same tracks, in the wake of others who have recorded the mind in movement; and for me the ghosts of Chatwin, Deakin, and Sebald travel still. 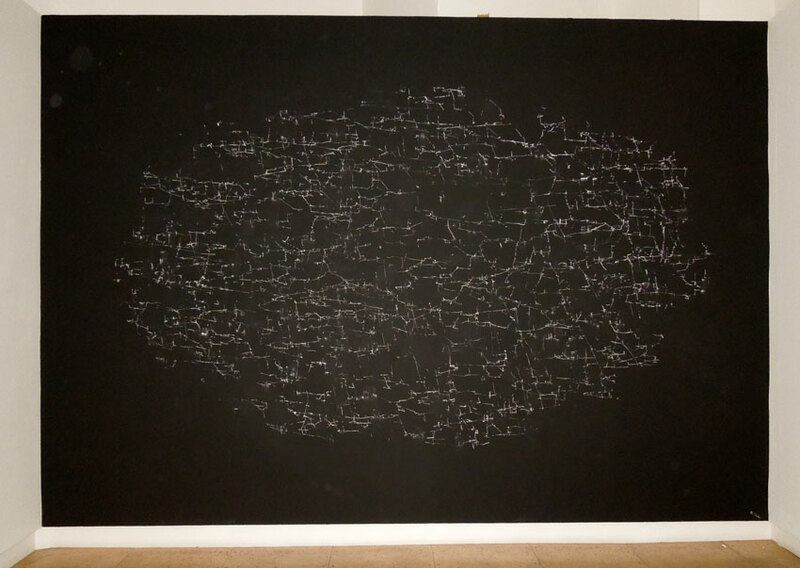 Night Tide and Constellation are being shown by the Adam Gallery at the London Art Fair this week. They belong to a group of large new works on paper that take the series of drawings I have made in recent years under an open sky on the east coast to a new level and scale. It conjures up a particular space where land and water meet, where the shifting light radiates across the salt marshes and where the tides move back and forth through the delicate maze of creeks and channels. It is also about the passage of time, a record not only of my own presence within this aqueous field but also of the incidental life that flows over it, from the migrating birds to the scattered flora that lines the ancient tracks and colours the scattered margins of distant islands. These images, like others before them, was made on a single day, and the prevailing conditions are mirrored in the drawing, in the way it succumbs to a sea breeze, an enveloping mist, or a sudden downpour. Pigment dissolves, runs and dries in unforeseen ways (and with unexpected results) as the paper’s surface becomes rain spattered, mud flecked, or softened by the rising waters. And each time the resulting image belongs as much to the elements as to the artist who began it.